In the spirit of Thanksgiving, and wanting to take a break from reading, thinking, and writing about nuclear energy, I’m offering my tried and true cooking instructions for something completely different. By Sunday night you will be stuffed, fed up, literally, and figuratively, with turkey. Instead of food fit for pilgrims, try food invented to be eaten in the wide open west — chili. Cook this dish on Saturday. Eat it on Sunday. Take it to work for lunch on Monday. The beer adds sweetness to the vegetables, as does the brandy, and is a good for cooking generally. In terms of the beer, which is an essential ingredient, you’ll still have five cans or bottles left to share with friends so there’s always that. The men and women running the reactors couldn’t drink beer, but they did have coffee. It’s still that way today. Scoville, Idaho, is the destination for Union Pacific rail freight for the Idaho National Laboratory (INL) way out on the Arco desert. The line comes up from Blackfoot, ID, using the UP spur that connects Pocatello with Idaho Falls, and, eventually, to Butte, MT. There is no town by the name of “Scoville,” but legend has it that way back in the 1950s & 60s, when the place was called the National Reactor Testing Station, back shift workers on cold winter nights relished the lure of hot chili hence the use of the use of the name ‘Scoville” for shipping information. The Arco desert west of Idaho Falls is both desolate and beautiful. In winter overnight temperatures on the Arco desert can plunge to -20F or more. Bus riders on their way to work in the early morning hours have sometimes been astonished to see the aurora borealis full of streaming electrons in the skies overhead of the sagebrush landscape. Some workers have a shorter trip than bouncing over Highway 20 from Idaho Falls. Their “commute” is from the small town of Arco which has a fabled history in the development of atomic energy. Why ‘2nd day’ in the Name? This is “2nd day chili.” That means after you make it, put it in the unheated garage or a refrigerator to cool, and then reheat it the next day. Do not microwave it. That will turn the beans to mush. 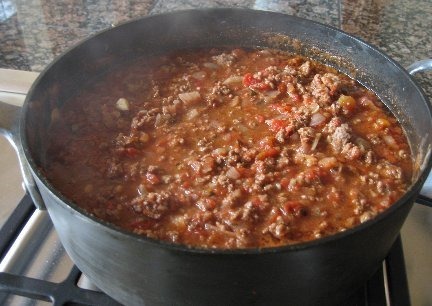 By waiting a day the flavors will have had time to mix with the ingredients, and on a cold Idaho night what you need that warms the body and the soul is a bowl of this hot chili with fresh, hot from the oven cornbread on the side. If you make a double portion, you can serve it for dinner over a hot Idaho baked potato with salad. Enjoy. 1. Chop the vegetables into small pieces and brown them in canola cooking oil. Add 1 tablespoon of cooking brandy to the vegetables near the end. Drain thoroughly. Sprinkle chili powder, salt, pepper, spices, etc., to taste on vegetables while they are cooking. The onions should be more or less translucent to be fully cooked. Put the mushrooms in last as they cook fast. Drain the vegetables and put them into the pot with beer and beef broth. 2. Brown the meat separately and drain the fat. Also sprinkle chili power and the cumin on the meat while cooking. 3. Combine all the ingredients in a large pot. Reminder, be sure to drain the beans, and tomatoes before adding. Simmer slowly for at least one-to-two hours Stir occasionally. 4. Set aside and refrigerate when cool. If the pot doesn’t fit in the frig, and the garage is unheated, put it out here to cool off. 5. Reheat the next day. Garnish with shredded sharp cheddar cheese. Serve with cornbread and beer. Idaho bus drivers say “eat more chili.” Enjoy.